Arnold Schoenberg (1874-1951) is best known for his invention of twelve tone (or atonal) music. This distinctive compositional method produced music that lacked a definite tonal or melodic center. Schoenberg opened the flood gates of creative invention and, along the way, may have driven a schism between composers and their audiences. (Only in the last quarter century has that gulf begun to be bridged by a new generation of creative artists who employ eclectic compositional styles -- including atonality.) Yet Schoenberg began his career as a grand musical romantic -- a disciple of Gustav Mahler. His string sextet Verklärte Nacht Op 4 (1899) is imbued with the ultra passionate nightmarish intensity of Wagner's Tristan and Isolde. Five years later Schoenberg produced his String Quartet No 1 in D Minor Op 7 (1904-05). This large scale chamber work received a rare performance by Germany's brilliant Artemis Quartet on 12 February 2004 at the University of Miami Gusman Concert Hall in Coral Gables, Florida, USA, presented by the Friends of Chamber Music of Miami. Schoenberg's first essay for string quartet is in one continuous movement lasting some forty seven minutes. The score is clearly divided into four inter-connected sections -- the equivalent of the traditional four movements. At one point a Brahmsian melody pours forth -- a vivid reminder of Schoenberg's reverence for that composer. (Schoenberg orchestrated Brahms's Piano Quartet in G Minor Op 25. He considered his transcription to be the equivalent of a Brahms Fifth Symphony.) For much of the score the influence of Mahler and Richard Strauss takes center stage. The eerie beauty of the quasi slow movement recalls the night music of Mahler's Seventh Symphony. The opening melody could well have come from a late Strauss opera. The score's concluding section hints at neo-classicism. (Schoenberg was always ahead of the musical curve.) However this score is not derivative in any sense. It is the work of a brilliant young composer who writes with great skill and sophistication. This beautiful work is a daunting challenge for any string quartet. The Artemis Quartet (Natascha Prischepenko and Heime Müller, violins; Volker Jacobsen, viola; and Eckart Runge, cello) delivered an edgy, intense performance that cut to the very core of Schoenberg's musical utterance. Prischepenko's incisive attack and strong emotional commitment brought the score vividly to life. The glowing tone and beautifully balanced sonority of the Artemis foursome captured the music's romantic aura to perfection. There is a magical moment when an intense climax suddenly becomes a barely audible, hushed pianissimo. Only a truly great quartet could make this boldly inventive musical effect seem inevitable. The Artemis players' performance was filled with such memorable moments. The beautiful melody of the second section (with its echoes of Brahms) seemed to engulf the hall with sheer string resonance. 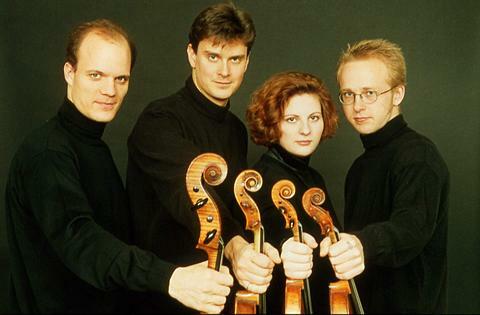 It is rare that a quartet plays with such dedication, fervor, and conviction. An incredible performance!